Before citrus goes out of season, I wanted to highlight one more citrus recipe. This one uses the little known finger lime (also called caviar limes). Have you heard of them? They are a really fun fruit to work with. When you cut them open and squeeze them, out comes these tiny little pearls that look like caviar. The little pearls contain lime juice that is released when the pearls are popped. So you get these great bursts of citrus as you’re eating them. My husband and I like these little limes a lot but we had only one recipe that used them. We decided we needed to expand our collection beyond that single recipe and discovered this one – salmon stuffed avocados with finger limes. 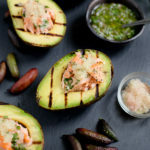 The avocado and salmon combination has never let me down and this recipe was no exception. You may be able to find finger limes at some specialty grocery stores and farmers markets. I find it easiest to mail order them (I order from Good Land Organics). If you can’t get finger limes, I think you can squeeze some extra lime juice on top and still have a fantastic dish. I prefer to roast my salmon in the oven but you can just as easily grill the salmon along with the avocados. My grilling game isn’t very strong and I have a really hard time getting the salmon to not stick and to cook evenly. Grilling the avocados is actually really easy. Start with avocados that are ripe but still a little firm. Then get the grill nice and hot. Grill the avocados for just a few minutes until you get some nice char. This recipe has so much going for it – it’s easy enough for a weeknight meal, the kids loved it, it’s fancy enough for dinner guests and those finger limes are built-in fun. In a small bowl, whisk together the lime juice, rice vinegar, and honey. Whisk in olive oil until combined. Stir in shallot and cilantro. Set aside. Rub the salmon with some olive oil and then evenly sprinkle the fish seasoning on the salmon. Place the salmon on a foil lined baking dish, skin side down. Roast the salmon in the oven until just cooked through, about 15-20 minutes. Set aside. While the salmon is roasting, heat a grill to high heat or heat a grill pan on the stovetop over medium-high heat. Rub the avocado halves with lime juice then olive oil and a pinch of salt. Place the avocados (flesh side down) on the grill or grill pan. Grill the avocados until they are charred and warmed through, 5-7 minutes. Remove avocados from the grill. Set aside. To serve, flake the salmon into large bite-size chunks. Stuff the avocado halves with the flaked salmon. Drizzle with dressing. Top each serving with the finger lime beads dividing equally among the 4 servings. Serve warm, passing any extra dressing and salmon at the table. For the fish seasoning, I use the salmon rub from Colorado Spice. You can find similar herb mixes at Williams-Sonoma and Penzey’s Spices. To remove the citrus pearls, cut the lime in half crossways (not lengthways) and squeeze from the bottom towards the cut edge. Remove any seeds with the tip of a small knife. Recipe adapted from Grilling Wino.